We’re addicted to coffee and that’s the harsh truth. But how could one not be? That’s the real question. Hundreds of thousands of companies would go bankrupt if they deprived their employees of the much-needed coffee break. On the bright side, it’s better to be addicted to this beverage than to other substances that are truly harmful. There are many methods of brewing coffee. Boil it in a kettle, brew it in a drip machine, brew it with a ﻿﻿French press, etc. Although the black liquid is available at pretty much every corner of the street, home brewed coffee is hard to match. Not only it is more delicious, but it’s healthier, too. The one you can purchase at a coffee machine, for instance, is less desirable and could potentially be packed with all sorts of dangerous substances. Since we’re talking about home brewed coffee, there’s one type of brewing tool that gives off the best coffee there is. That is the already famous Moka Pot. If you haven’t heard of it, you’ve been missing on lots of cups filled with the to-die-for energizer. Get your Moka pot, because we’re about to teach you how to make such a good coffee that you’ll start scoffing when you see water. But first things first: what’s a Moka pot? 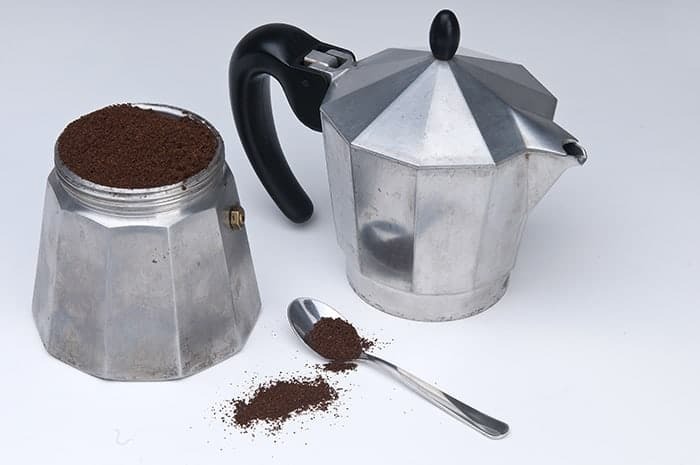 The Moka pot was patented in 1933 by Luigi de Ponti, an Italian inventor, as a commission for the engineer Alfonso Bialetti. The design hasn’t changed since then. So, what is it? It’s a coffee maker made out of aluminum. How does it work? Well, you place it on the stove, and the boiling water is passed through the c﻿﻿offee gr﻿﻿ounds. It works on basic physics: the pressure of the steam injects hot water through the coffee grounds, which, in their turn, end up in the collecting room. Simple and efficient. So, did you ever wonder how Superman could fly to the end of the world and back in a matter of seconds? He drank coffee, obviously. Let’s get to the step-by-step guide on how to brew coffee with the Moka pot, and we’ll see you right next to Superman. One repeating complaint about brewing coffee with a Moka pot is that the coffee is often times bitter. That doesn’t happen when you fill the reservoir with already hot water. Moreover, the brewing will be quicker, since the water won’t need time to reach the suitable temperature for the process to begin. Pro Tip: There is one thing to keep in mind: a Moka pot has a pressure valve on the side of the boiler. Do not fill the reservoir above this valve. This is meant to manipulate pressure. For instance, if there’s too much pressure, the valve will release it. If you cover it with water, it won’t do it anymore, so you’re prone to having a small bomb on your stove. Take a look at the filter of the basket. Make sure that the grind you’re using will not clog it. In other words, the grind shouldn’t be too coarse nor too fine. By ensuring that the grind is perfectly sized, the pot will work smoothly, and it won’t need much maintenance. Pro Tip: There are many people that advocate for filling the basket to the brim. Don’t do that. If the basket has more coffee in it, then the pressure needed for brewing will be bigger. That could culminate with the pot blowing on the stove. Do not overfill the basket! When you put the ground coffee in the basket, some of the grounds will inevitably fall all over the place. You don’t need a towel or a handkerchief, just run your index on the lip. If you don’t remove those grounds, the pot may not screw correctly. After you’ve done the cleaning part, screw the Moka pot as tightly as you can. Pro Tip: If you don’t screw it properly, there may be some water or coffee leaks as you brew your coffee. That’s quite dangerous because the pressure valve can go off and you’d have to drink your beverage from the walls. Make sure the Moka pot is screwed correctly before you put it on the stove. Step 4: Put the magic-maker on the stove! Do not make the mistake of putting the Moka pot on high heat. There will be more coffee on the stove than in the collecting chamber. Low-medium is the best heat. The brew will be collected in a gentle manner. If it shoots out of the funnel madly, decrease the heat or hold the pot in your hand, above the flame. Also, try to place the pot on the outer edge of your stove, with the valve pointing in the other direction from you. Now look closely at the collecting chamber, and watch your precious liquid flowing from the funnel in all its dark glory. When the collecting chamber is about to get filled up to the brim, you can remove the Moka pot from the stove. You can place it on something cold to stop the brewing process – the blade of a knife, for instance, or a towel soaked in cold water. If you do not stop it, the coffee will become bitter. 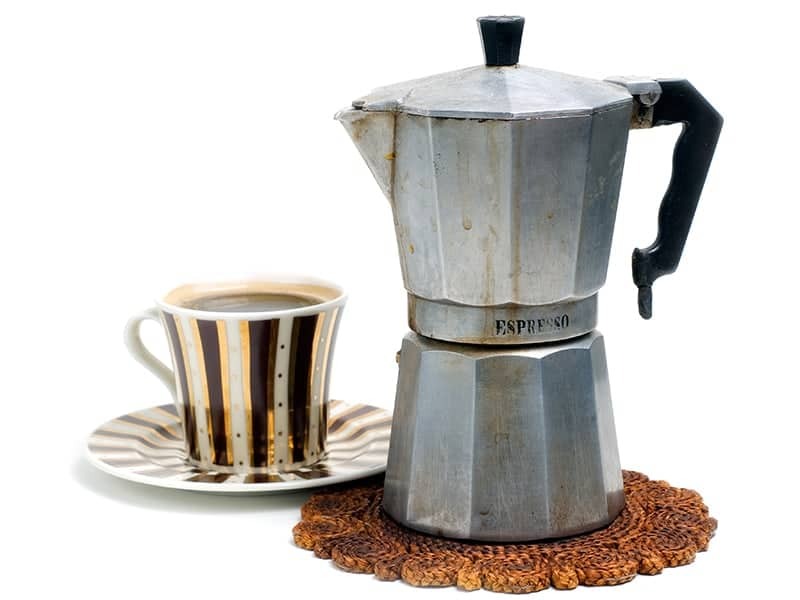 Moka pot coffee is rather strong, so you might want to add some milk or water to dilute it. It might even be too strong for people who like strong coffee in general. If you can’t stand it as it is, milk will do the trick. Moreover, if it’s too strong, you’ll know how many grounds to use next time, so you get a slightly weaker beverage. Moka pots come in various sizes. You must assess how much coffee you and your family drink and buy an appropriate pot. For instance, there are Moka pots that are expressly designed to brew 6 cups. Why would you buy one of these if you don’t need 6 cups of coffee daily? Sure, you can still use it, but it will be difficult to guess the coffee quantity that goes into it. If possible, purchase a Moka pot that is made of stainless steel. It will last longer, and it deals with heat better than an aluminum-made one. Do some research before you buy any model. 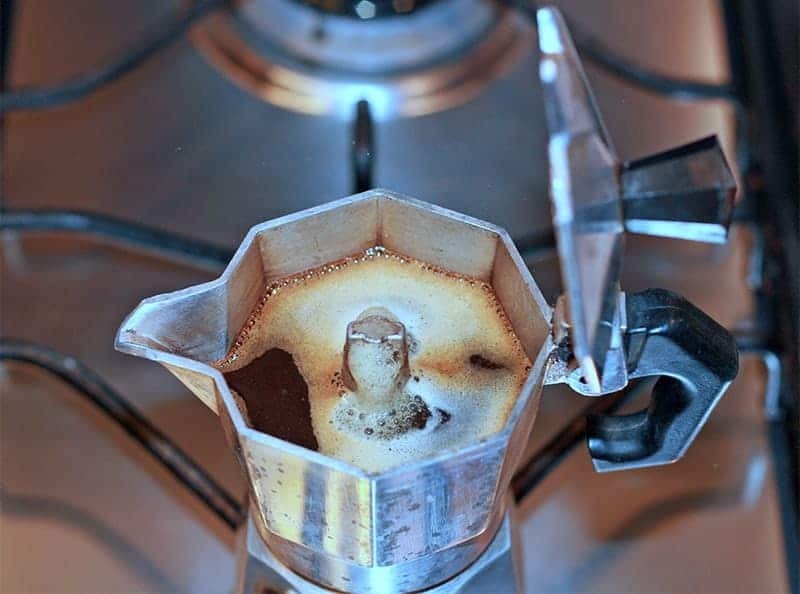 We've done it for you - Check out our reviews of the best moka pots (stovetop espresso makers). Decide on the size and the material yourself. Try to aim for a model that has been made by the original manufacturers. This way, you make sure that you’re getting quality for your money and not some fake pot that breaks after a few uses. The pot is actually very easy to clean up. First of all, make sure it cooled down. Don’t use any soaps or dishwasher detergents because they will affect the aluminum layer. Disassemble the pot, remove the grounds and then simply rinse each component. Let the pot dry on a towel, then reassemble it. It’s very important to let the parts dry properly. Aluminum does not rust, but it corrodes. Corrosion isn’t that dangerous, but it would give the pot a very unpleasant color. You can hand-dry the parts to make the process even quicker. The Moka pot is pressurized, so it can blow up if it’s used incorrectly. In order to avoid that, don’t cover the pressure valve on the side of the reservoir. Always keep an eye on that. The maximum water level is just below that small valve. Secondly, don’t overfill the basket with coffee grounds. It will require more pressure to brew, which can end up in a small-scale explosion. Also, do not tamp the grounds, because the result will be the same as when you overfill the basket. Sometimes, steam and water can leak from the pot. That happens when you didn’t screw it properly. Remove it from the heat source immediately. Check out if it has been sealed as it should’ve been in the first place. If that’s not the cause, inspect the funnel and see if it’s clogged. The espresso is one of the strongest types of coffee. It usually comes as an unsweetened shot that gives you a jolt of energy. Some people don’t like it because it’s too bitter and too strong. Anyway, it’s healthier than sweetened coffee, for obvious reasons. 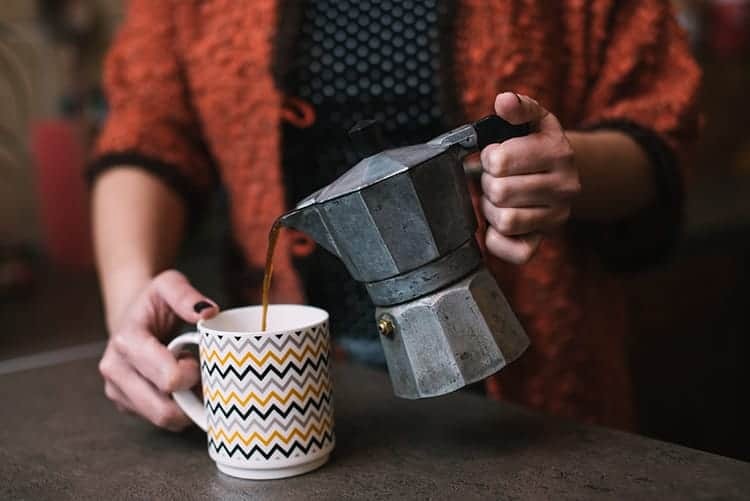 There’s no actual guideline to how to make espresso with the Moka pot; simply pour the coffee in the cup and drink it as it is, without adding anything else. Irish coffee is delicious, period. This is how you make it: brew a cup of Moka pot coffee, pour it in a cool glass, dilute it with two tablespoons of hot water and add Irish whiskey and some brown sugar. Stir the mixture up and add a topping of whipped cream. Be careful not to mix the cream with the coffee, though. Sip the coffee with a straw through the cream. You can easily avoid the two mixing together by using spray whipped cream. The Americano coffee is a simple espresso diluted with some hot water or milk. It’s the go-to alternative for the people who don’t like strong coffee. Mocha works perfectly during the winter, and it goes really well with a layer of blankets and one of your favorite books. Mix some milk with cocoa powder and add it to your coffee. If you want to feel even more pampered, you can sprinkle some cinnamon on top. You’ll get a Christmas-y vibe. Latte is basically coffee with milk. However, you can add some extra flavors to it, to crank the game up a notch. Again, cinnamon is the number 1 contestant. It just goes so well with coffee. Vanilla extract, peppermint oil or coconut milk, too, are fantastic. You can flavor your coffee with pretty much anything you might think of, as long as the two go together. Some put eggs and butter in theirs. 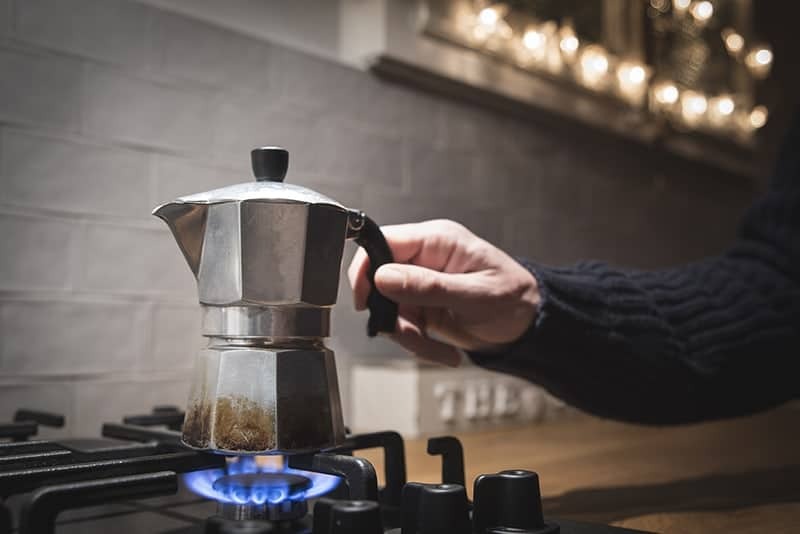 The Moka pot is a fantastic alternative for those who cannot afford expensive coffee makers or simply think those aren’t worth the hassle. But here’s the inside scoop: you don’t actually need costly espresso machines. The coffee’s no different. You can make it a lot easier for you: a Moka pot is very cheap, it’s efficient and easy to clean. What’s more, it’s easy to find. There are many online retailers that sell it. Respect the steps in this guide religiously, especially the ones that insist on the safety concerns. You mustn’t start to think about your Moka pot as of a nuclear reactor. We hope that this guide has been helpful. All things considered, a Moka pot is probably everything you need to make yourself some fantastic coffee. Don’t spend fortunes on coffee makers, because guess what: if they break, maintenance can be as costly as the machines themselves. Moka pots rarely or never need any maintenance. Please tell us: did you ever use such a pot? Would you use one if you had the chance? I own several. This was a great article! I love mine…..had it sitting around our house for yrs until my sons gf showed us how to use it , and made it for us! Now we wont have coffee any other way! The bad part is we need to replace a gasket and the box got thrown away!